Allow the installation of non-Play Store apps. Install the App on the device. Register the App with Essentials. The end user only needs to do this if the App is not preregistered in the installation package. License the App using your ArcGIS Runtime SDK license. The end user only needs to do this if the license is not preconfigured in the installation package. The end user only needs to do this if you have made additional resources available that the user wants to use, for example, locale files. On the device, open Settings. Under DEVICE ADMINISTRATION, ensure the Unknown sources checkbox is selected. Download the Geocortex-Mobile-App-Framework-2.3.2.apk file to the device. Once the App is installed, users can open the App the same way they would open any app on their device. The newly-installed App contains a sample viewer and no resources. Make sure to replace MyClientID with your own Client ID. To make the URL easy to visit, create a QR code or hyperlink and publish it to a website or email it to users. This applies the license. The App is now licensed with your Basic license. Make sure to replace the value of the arcgislicensecode parameter with your own license code. We recommend that you URL-encode the license code in the URL. This replaces the commas (,) with %2C—some browsers do not handle commas well. This applies the license. The App is now licensed with your Standard license. Open the App on the device and sign in to Portal for ArcGIS or ArcGIS Online. This applies the license. The App is now licensed with the license that is associated with your Portal for ArcGIS or ArcGIS Online account. 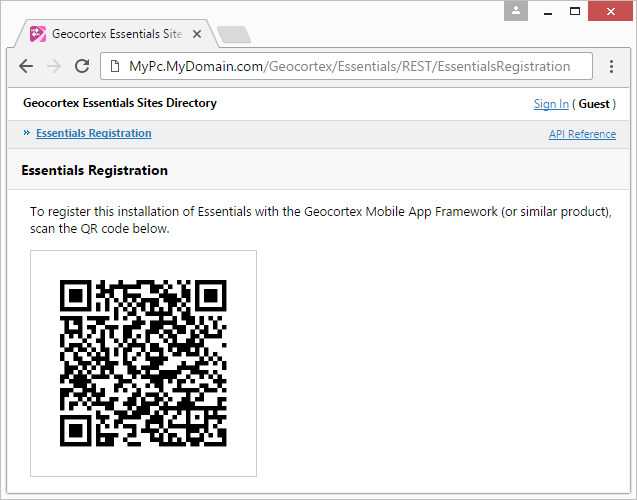 Registering the Geocortex Mobile App Framework with an Essentials instance allows the App to download viewers automatically to the user's device and offer users a list of viewers to add. You only need to register the App once. If you obtained a customized installation package from Geocortex Support, you can skip this step—the App is already registered with Essentials. Geocortex Essentials ships with a registration page that is deployed to IIS when you install Essentials. The registration page has a QR code that registers the App with that instance of Essentials when scanned by the device that the App is installed on. If the device does not support scanning QR codes, you can enter the registration page's URL instead of scanning the QR code. Be sure to replace MyServer.com with your Essentials host name. Use the device to scan the QR code on the Essentials Registration page. You can also use this method to change the instance of Essentials that the App is registered with. In the App, on the Saved Viewers page, tap . In Geocortex Essentials Manager, edit the site that contains the viewer. In the side panel, click Viewers. Click the Edit icon beside the viewer for which you generated the offline data. The Launch in Geocortex Mobile App Framework link that appears is the launch link. A corresponding QR code appears when the mouse pointer is hovered over the QR code icon beside the link. Create a link or QR code that points to the URL. Publish the link or QR code to a website that end users have access to, or send the link or QR code in an email. To add the viewer, users either scan the QR code, or open the email on the device and tap the link. The viewer appears on the Saved Viewers page. To add the viewer, users type or paste the URL into the address bar of a web browser on the device. The viewer appears on the Saved Viewers page. Chrome for Android does not handle these URLs properly. Typing the URL into the address bar does not work in Chrome for Android. If you have made additional resources available to end users, such as locale files, users can download the resources now. To download a resource, the user taps the resource's link or scans the QR code that you have provided. For more information, see Create and Deploy Additional Resources.